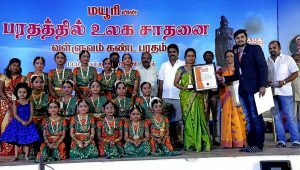 Mayuri Academy of performing arts from Chennai, Tamil Nadu, India, organized an event, wherein 15 participants performed longest(30hrs) Thirukural couplets based Bharathanatyam, starting at 10:45am, on January 1, 2017 and ending at 5:05pm, on January 2, 2017, at Paramadevi Goyal Auditorium, Anna Adarsh College For Women, Anna Nagar, Chennai. Comments for LONGEST THIRUKURAL BHARATHANATYAM MARATHON are now closed. Copyright © 2019 Asia Book of Records | All disputes are subject to Faridabad jurisdiction only.